Earlier this year the Front Royal Pregnancy Center was blessed by the generosity of an anonymous donor who set up a matching grant for monthly donations: any new or increased monthly donations will be matched, up to $1,000/month. This is a great gift to the Center because monthly gifts help us budget throughout the year and give us more accurate information on how much of our funds we can dedicate to different programs. Two exciting new programs we are working on now are providing male mentorship to the husbands and boyfriends of our clients, and an outreach to local schools to provide information on healthy relationships. We began spreading the word about this initiative in February, and the response has been remarkable. 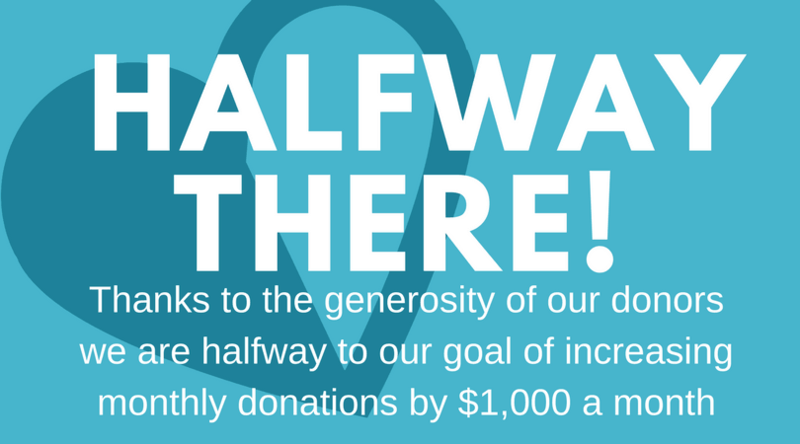 Thanks to our donors we are over halfway to the goal of $1,000/month more! Their generosity never fails to amaze and encourage us. We would like to extend a heartfelt thank you to our monthly donors for their support. If you’d like to join their ranks and help us reach our goal of a $1,000/month increase in monthly donations, click here. With your help, we can get even closer to our goal!